Every family has their own traditional Paska recipes they love. My mother makes a citrus flavor Paska. A friend of mine uses saffron in her recipe, another Cardamon and of course we all love the famous Paska by Lovella. Each recipe delicious yet different.This is my sister by love's recipe using potatoes and potato water but no citrus. I prefer to make Paska Buns instead of loaves for the simple reason that we are not tempted to eat the whole loaf. Each bun has lots of icing and sprinkles, what is not to love about that. This dough is easy to work with, ending with a soft and tender bun. I got 92 buns from this batch. Thanks for sharing your family tradition with us Patty. In a very large mixing bowl combine the yeast and sugar in the water and give it a stir. Let it rest for 10 minutes until you have a nice foam. Cook the diced potatoes in the cups water. Mash and let cool. (Or put it in the blender for no small chunks of potato). Heat the milk, sugar and vanilla til very warm to touch. Add the beaten eggs and pour it into the potato water and milk mixture. Add the liquid ingredients to the yeast bowl. Add 6 cups of flour to make a paste. Let this mixture rest and rise for 20 minutes. Add remaining flour to make a soft dough. You may need a bit less or more depending on the humidity that day. Knead for about 10 minutes until dough is no longer sticky but soft. Let rise in a warm place for 2 hours. Form into buns and let rise about 45 minutes to 1 hour. Bake at 325 for 15-20 minutes. Buns work for me... As a side note I refer to my SIL as SIH..Sister in Heart. 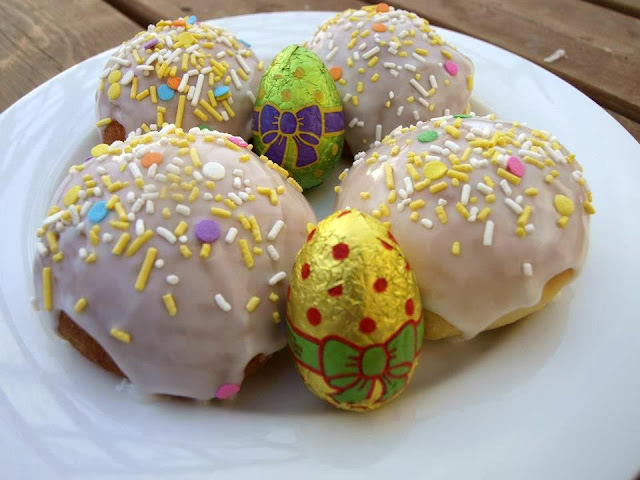 Every year I try a different recipe for Paska - this year it will be this one. My now nine year old granddaughter loves to bake with me and we wind up with really unusual shapes but they all taste great! Thanks for sharing. Is there no salt in the recipe? I want to try this recipe but wonder if there should be salt in it?? Thank you for pointing this out that I missed the salt, I added it now. It doesn't need more than a teaspoon. Since my son is lactose intolerant I have been on the search for a Paska recipe, mine had whipping cream in it. Had tried to change, without much success. Tried your recipe yesterday and we all are enjoying them. Used Crisco and lactose free Milk. They turned out very moist and delicious. Thanks again for a great recipe. Is 2 cups of melted shortening correct? Can I use butter instead? Is 2 cups of shortening correct? Can I use butter instead? Natalie, I don't see why melted butter won't work. I think you could try it. It may change the texture a bit, but it will still be good. where do you add the shortening? Is this included in " add the liquid ingredients to the yeast bowl" ?